There must be some unwritten rule somewhere, tacitly and silently agreed upon by game companies in dark rooms, which says that every few years, once-prominent mascots must suffer through awful video games. 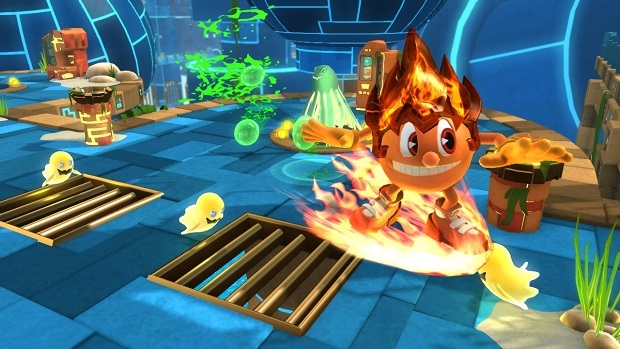 It’s a formula that Sega has honed for the better part of the last decade with the Sonic franchise (see: Sonic Boom and Sonic ’06), the great Sonic Generations notwithstanding. The recipe looks a little something like this: take a once popular gaming icon, give him a stupid visual redesign and a number of equally stupid friends, and mash them all together into a children’s television show that has little, if anything, to do with the character’s original premise. After you’ve done that, you can start making the video games. Not video games based on the original video games, mind you, but video games based on the TV show, which is, of course, based on the video games. This is the kind of crap that only used to happen with comic book companies. DC pulled something like this recently: they made a MOBA called Infinite Crisis based on the 2004 comic book of the same name, then published another comic book called Infinite Crisis based on the MOBA with was, of course, based on the comic book series. You gotta hand it to Namco, though. Like DC, they’ve managed to come full circle, and that takes commitment. "Ironically, the best missions aren’t platforming romps at all, but special missions that resemble shoot-em-ups, and the occasional boss fight. This is when the game genuinely feels like it’s firing on all cylinders, and when the score mechanics that the rest of the levels try to push, often unsuccessfully because keeping your combo going discourages exploration, work out in the game’s advantage. What they’ve come up with, unfortunately, isn’t particularly good, or very original, or very much of anything except rather generic and kind of painful. The problems start with the characters: like pretty much every other mascot this side of forever, Pac-Man has been saddled with a frighteningly large group of sidekicks with annoying voices who follow him around shouting things like “Good job, Pacster!” just as you’ve plummeted to your death. A very intelligent bunch, these. Pac-Man himself isn’t any better. In fact, the titular character doesn’t sound very manly at all, more like a pre-pubescent boy, or perhaps even more damning, a pre-pubescent boy voiced by a girl (which, if the credit to his voice actor is accurate, appears to be the case), ever the sign of good, quality children’s television. That was sarcasm, in case you couldn’t tell. What are Pac-Brat and his cronies up to? Well, just saving the world from some nasty ghosts. Why are these ghosts nasty? Because reasons, that’s why. And you’d better stop them, or Pacopolis will be destroyed. Yes, the city that they live in is called Pacopolis. Oh, and the leader of the Ghosts? His name is Betrayus. That is a real thing. God have mercy. Anyway, saving the world from the big bad ghosties generally involves leading Pac-Tween through some pretty standard 3D platforming levels while eating the little yellow orbs (because he’s hungry, I guess. They really don’t give you anything other than points), fruit, and various power ups in search of a high score. You can also get some pretty standard power ups that allow you to do the kinds of things that other platformers have been doing for a couple of decades. "Anyway, saving the world from the big bad ghosties generally involves leading Pac-Tween through some pretty standard 3D platforming levels while eating the little yellow orbs (because he’s hungry, I guess. They really don’t give you anything other than points), fruit, and various power ups in search of a high score. The level of cribbing (cribbage? Whatever, we’ll roll with it) here is kind of astounding, actually. Wall-jumping, Super Mario 64 style? Yep, that’s there. Those double-sided platforms that change sides when you jump, from the recent 3D Mario games? Ditto. The standard three collectibles scattered over the place that you can collect to increase your score? Yep, they’re there, just as fruit. Chasing a high score or a multiplyer in certain sections for special power ups? Yeah, man. Even the power-ups are pretty standard, with the exception of the metal Pac-Boy, which actually allows the developers do something cool. The metal ability lets Pac-Man magnetically stick to metal walls, which means you can walk upside down and vertically. This allows the levels to pull some interesting tricks, and explore a level of horizontal (and vertical) interaction that just isn’t in most platformers. The other major difference is the focus on building a score by keeping a combo going, and scaring ghosts, which increases your combo multiplyer and offers more points when you eat them. That doesn’t really make up for “been there, done that” nature of many of the game’s platforming levels, but The Ghostly Adventures 2 does genuinely try to change it between levels, offering challenge missions that focus on one of the power-ups and a number of side missions. Ironically, the best missions aren’t platforming romps at all, but special missions that resemble shoot-em-ups, and the occasional boss fight. This is when the game genuinely feels like it’s firing on all cylinders, and when the score mechanics that the rest of the levels try to push, often unsuccessfully because keeping your combo going discourages exploration, work out in the game’s advantage. "The game just suffers from bog-standard level design, annoying characters, dated visuals, unskippable dialogue if you make the poor decision to talk to any of Pac-Man’s friends, an occasionally poor camera and annoying scoring system that seems at odds with many of the level’s fairly open-ended nature. Still, this isn’t enough to make up for the unimpressive graphics, the rote platforming, and the uneven level design that simultaneously encourages you to explore but then punishing you for it by damaging your multiplyer or arbitrarily killing you because you’re fighting the camera angles during certain segments. Honestly, Pac-Man and the Ghostly Adventures 2 isn’t a terrible game. Some of the levels are genuinely interesting and well-designed, and a lot of the special levels are truly engaging. The game just suffers from bog-standard level design, annoying characters, dated visuals, unskippable dialogue if you make the poor decision to talk to any of Pac-Man’s friends, an occasionally poor camera and annoying scoring system that seems at odds with many of the level’s fairly open-ended nature. In all, it’s one of those licensed games that feels rather limited by its license than expanded by it. It’s a game that exists because Pac-Man is a thing, and Namco is searching for ways to make that thing, a true child of the arcade, relevant in the age of consoles. In some cases, they’ve succeeded, with titles like Pac-Man DX: Champsionship Edition. 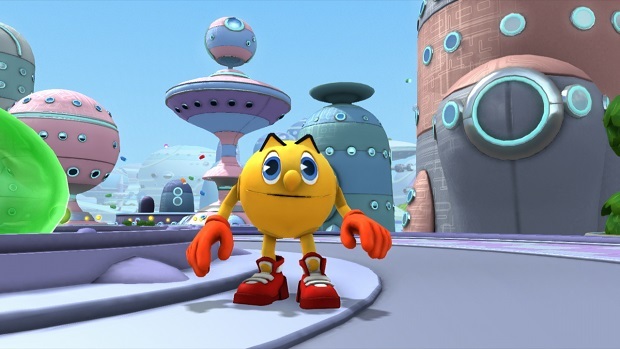 But with Pac-Man and the Ghostly Adventures, it feels Namco’s busy chasing ghosts, looking for a time when Pac-Man was relevant, and when his games carried so much potential. Getting a high combo is satisfying. The Metal Pac-Man power-up is interesting and has unique environmental uses. The shoot-em-up levels and boss fights. Mediocre visual presentation. Poor camera. Rote platforming. Poor voice acting and supporting characters. The scoring system simultaneously encourages exploration and then punishes you for it. 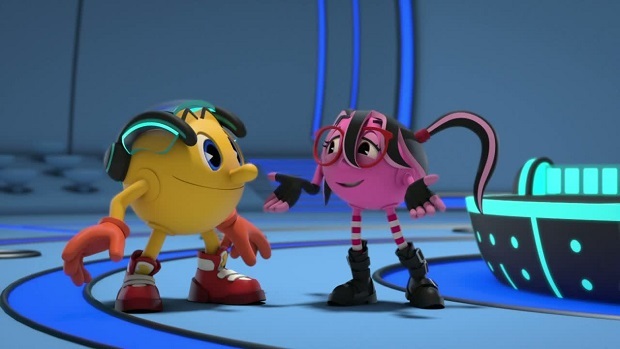 A game only for huge fans of the Pac-Man and the Ghostly Adventures television show, or huge fans of Pac-Man in general. 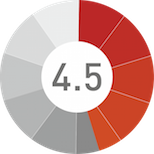 It’s not terrible, but it is below average, and there are significantly better platformers out there for both children and adults. Pac-Man deserves better, and so do his fans.